"I wanted to capture a photo in which you would see a wolf in an act of hunting - or predation - but without blood," he told BBC News. "I didn't want a cruel image." With a great deal of patience and careful observation of the wolves' movements, he succeeded in taking the award-winning photograph. The WPY competition, now in its 45th year, is owned by BBC Wildlife Magazine and London's Natural History Museum. The panel of judges looked through more than 43,000 entries to this year's competition. This is the fifth year that wildlife photographer Mark Carwardine has been on the judging panel. He said of the winning photo: "It's captured thousands of years of human-wolf interaction in just one moment." Mr Rodriguez won the Animal Portraits category and went on to win the top prize with this haunting image that the judges said captured the character of the wolf. When he started planning the photograph, he feared that he might not be able to get close enough to the Iberian wolves. This subspecies of the grey wolf lives close to human habitation in northern Spain. They are often persecuted by people who see them as a threat to livestock, and they are consequently very wary. Watching the animals as they returned to the same spot to collect food each night, Mr Rodriguez decided on his dream shot. He eventually captured it using a photographic trap that included a motion sensor and an infrared barrier to operate the camera. 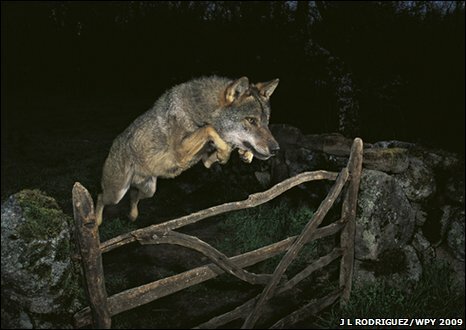 He hopes that his picture, "showing the wolf's great agility and strength", will become an image that can be used to show just how beautiful the Iberian wolf is and how the Spanish can be proud to have such an emblematic animal. Fergus Gill, who was 17 years old when he entered the competition, won this year's Young Photographer of the Year award for his picture of a brief but dramatic clash between two of the colourful UK songbirds. He started planning the image in summer, collecting oat sheaves from a local farmer specifically as winter food for the yellowhammers. One evening in February, hearing that snow was forecast for the next morning, Fergus set up his hide in the garden of his home in Scotland and hung out feeders for the birds. "At one point, I counted 32 yellowhammers feeding on the ground," he said. When the snow fell, the birds jumped up on to the feeders and the males would occasionally fight over the oats. "The spats were incredibly fast," he said. It took Fergus two days to capture the dramatic clash that earned him his award. With the help of his feisty cat, Igor Shpilenok won the Urban and Garden Wildlife category with this shot. He spent five months as a ranger in the Kronotsky Nature Reserve in Kamchatka in the east of Russia, and took his cat Ryska with him for company. "It's a very remote place and there were lots of animals - bears, foxes, wolverines - living near my cabin," he told BBC News. "The cat was really jealous about me. If I started to look at the animals, she would attack them. Just like a woman," he smiled. "Maybe she thought I was her pet." But the animals were curious about the area's new residents, and were drawn by cooking smells from the cabin. The foxes in particular would visit every day. "When they came within 20m, that was her boundary and chased them. It was really funny - foxes were climbing trees to get away from the cat." Mr Shpilenok's wife, Laura Williams, selected the category-winning image. "It's ironic," she said. "He photographs the wilderness, but the two times he's won a category [in this competition] it's been the urban wildlife one. Because the wilderness is his back yard." Urmas Tartes won the Animals in their Environment category for this image of a springtail, otherwise known as a "snow flea" navigating its way through delicate snowflakes. When the temperature drops below freezing, the insect climbs down through the frosty crevasses to the warmer soil below. "But they're only active a few degrees below zero," Mr Tartes told BBC News. "I had to 'ambush' the weather for just the right temperature and conditions. "I was travelling with my wife and it started snowing slightly," he recalled. "We came to a place where we thought it might be possible [to see the insects] and the thermometer in the car said it was just the right temperature." Mr Tartes had waited for the perfect weather in which the snow fleas would be active, but the snowflakes would remain frozen. His patience paid off, and he managed to take over 100 shots while the insects negotiated their way through the tricky terrain. He believes he captured something truly unique and that this was largely thanks to his knowledge of his country and its climate. "I think the best of the photos I take are in my homeland," he told BBC News. "There's a saying in Estonia that in order to see new things, you have to follow common paths - paths you know." Tom Schandy won the Gerald Durrell Award for Endangered Wildlife for this image, which he took while working on a book project in Brazil. "We spent a few days on a boat along Rio Paraguay and saw four jaguars in the space of three days. "It was really amazing, because it is such a difficult animal to find. "This one was very relaxed - it just lay on the river bank staring at us for more than an hour. "It was a glimpse into the eye of the wilderness." At sunset, the jaguar rose, yawned and scent-marked. Then he faded back into the dense forest.